Image of FU Ori obtained by Cesar Briceño (Centro de Investigaciones de Astronomia (CIDA), Merida, Venezuela) with the 1.2-m telescope at the Fred Lawrence Whipple Observatory, Mt. Hopkins, Arizona, USA. The image is a 600 second I-band exposure taken with a 2k x 2k CCD camera (AndyCam). The image is 10'x10'; north is up and east is to the left. 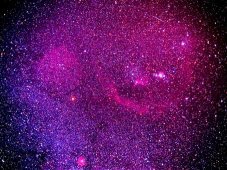 FU Orionis resides near the imaginary shoulder of the great hunter constellation of Orion, at a location of about 3 degrees NW of Betelgeuse, and less than a degree east of the small planetary nebula NGC 2022. Although FU Ori can now be seen fluttering around 9th magnitude, its appearance hasn't always been so brilliant. FU Ori's rise to fame began in 1937 when the star appeared from relative obscurity at 16th magnitude and brightened by a factor of over 100 in 100-200 days. Accompanying the phantom star was a bright nebulosity, which glowed as a reflection of light from the luminous star. After increasing by 6 magnitudes in a period of a year, FU Ori continued to linger around maximum magnitude, where it has resided in a high state along with its ghostly nebula association ever since. Since only one eruptive episode had been detected and because nothing was known of its pre-outburst state, the 1937 uprising of FU Ori was first thought to be a nova event. Although spectroscopic evidence suggested otherwise, interest in FU Ori and its nature seemed to wane with time. Since no other star was known to behave like FU Ori and since little was known about the star itself, astronomers waited for further clues from FU Ori or more examples to emerge. In 1970, the FU Ori-like behavior appeared again when similar properties were observed in V1057 Cyg's climb to maximum light. With a rise time of about 390 days, V1057 Cyg increased in brightness by 5.5 magnitudes. Then a few years later in 1974, a 3rd example was recognized when V1515 Cyg rose from magnitude 17 over an exceptionally slow interval of about 20+ years. Now at 12th magnitude, the star took at least 12 years to brighten the final 2 magnitudes (Herbig 1977). All three of the stars mentioned displayed similar but not identical properties: all are F or G supergiant stars with wide absorption lines, have P Cygni structure at H-α (blue-shifted spectral lines that indicate the expulsion of material), have displaced shell components, and show strong Li I λ6707. In addition, all possess strong infrared excess and are associated with arc-shaped reflection nebulae, which become visible as the star brightens. This giant gas cloud that engulfs the constellation of Orion represents the closest star-forming region to Earth. At a distance of 1500 light years and spanning over 100 light years, this cloud houses such greats as the Horsehead Nebula, the Orion Nebula, and the Trapezium open cluster. Close inspection of the above image reveals the three stars that make up Orion's belt. Image credit: J.C. Casado. With a handful stars showing similar properties, astronomers have since been able to study the behavior of these peculiar stars. Now, decades after the initial 1937 event, FU Ori serves as the prototype of a small class of variable stars which today consists of about 10 members. FUors, named for the leader of the group, are in fact pre-main sequence stars in the early stages of stellar development. The FU Ori phenomenon may be a significant process and may provide astronomers with an early history of a star, including the nature of pre-main sequence life and the formation of planetary systems! Many stars in the pre-main sequence stage of stellar life are seen to vary in brightness. For instance, the T Tauri stars change in appearance by about 3 magnitudes at irregular intervals, and the Herbig Ae/Be stars exhibit sporadic variations of ≤1 magnitude. EXors, named for the prototype EX Lup, constitute a poorly studied class of variables that have been observed to undergo small eruptions of 1-3 magnitudes, which last several years. However, the stars with the largest amplitude of variation in this group of stellar toddlers are the FUors, with an amplitude of 3-6 magnitudes. The rise time of the FUors is gradual and after achieving maximum light, they often remain in the high state or slowly decline by just a couple of magnitudes. These 5'x5' red-plate images of FU Ori (top) and V1515 Cyg (bottom) from the STScI Digitized Sky Survey show the arc-shaped nebulosity that is often associated with FUor activity. The association of the FU Ori phenomenon with the pre-main sequence phase of stellar evolution was first proposed by G. Herbig in the 1960s and 70s. Herbig came to this conclusion based on the following characteristics of the FUors: (1) they are associated with dark clouds that have radial velocities indistinguishable from the cloud velocity; (2) they have similar spectra including a high lithium abundance, analogous to the spectra of the T Tauri stars; (3) they show a rise in brightness that is evidence for a real luminosity increase that is not a nova outburst, as would be the alternative conclusion; and finally, (4) the pre-main sequence star activity is supported by event statistic calculations (Kenyon 1999). Kenyon (1999) suggests that there are even more characteristics that tie the FUors together. As he points out, most of the FUor stars have a coma-shaped reflection nebula associated with the active star that glows in the optical and near-infrared wavelengths. FUors also tend to have broad, blue-shifted (again, indicating expelled material) Na I and H I absorption features. Optical line profiles may change on month to year time scales, while the near-IR profiles may also change. All have broad optical or infrared absorption lines or both; many display doubled absorption lines on optical and near-IR spectra. All FUors show an excess of ultraviolet and infrared radiation over normal G supergiant stars. Many FUors are strong radio continuum sources at centimeter wavelengths that may be produced by the outflow of a jet, which is a feature that is commonly associated with such objects. An artist's impression of a young star-disk system. Copyright Russell Kightley Media. Since FU Ori stars are thought to be pre-sun-like stars, we know that they have only just formed from the cloud of dust and gas in interstellar space that occur in active star-forming regions. At this stage of evolution, the star has coalesced under the influence of gravity and begins heating and glowing, while the outer portions of matter form disk around the emerging star. The result is a centrally forming star surrounded by an accretion disk. According to Turner et al. 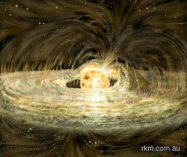 (1997) and references therein, the star-disk system is in an early stage of development such that matter is falling onto the outer regions of the disk from the surrounding interstellar cloud. Thermal instabilities, most likely in the inner portions of the disk, initiate an outburst. The duration of the outburst is determined by viscosity within this hot, ionized area. The eruption then declines when the region has been depleted by accretion onto the central star, whereby the temperature drops such that hydrogen can then recombine. The interval between eruptions depends upon the rate of mass transfer in the inner portion of the disk. When the mass at the inner disk reaches this critical value, the temperature rises high enough again to ionize hydrogen, thus repeating the cycle. FUor systems cycle between the high and low states of mass accretion as long as the surrounding cloud replenishes the disk between outbursts. Such eruptions add a significant portion of stellar mass to the central star. Likewise, the FUor eruptions contribute a large amount of mass to the surrounding cloud. Within the accretion theory, the accretion rate through the disk increases 2-3 times the normal flow such that the rate increases to ~104 solar mass per year. During the eruption, the mass flow from the disk onto the star is very large, approximately 1 Jupiter mass every decade! According to Kenyon et al. (2000) this model not only accounts for the increase in luminosity, but also explains the broad spectral energy distributions, the variation of rotational velocity and spectral type with wavelength, as well as other properties commonly observed. FUor eruptions are thought to be a repetitive process, though no confirmation has yet been observed. Although the FU Ori phenomenon is rare in terms of the lifetime of astronomers, Herbig (1977) speculates that perhaps all T Tauri stars go through one or more of these episodes in their lifetimes. It is known, for instance, that the FUor star V1057 Cyg was a confirmed T Tauri star prior to outburst. Herbig further suggests that perhaps the FUors recur in the average T Tau star after roughly 104 years. Kenyon (1999) states that based on statistics for known FUors, the young stars probably undergo 10-20 FUor eruptions before reaching the main sequence. Two hundred days of FU Ori from the AAVSO International Database. In addition to the nearly 1 magnitude oscillatory pattern seen in FU Ori at maximum, FU Ori also flickers on a small scale at about 0.035 mag. (Flickering is not seen here.) Lines connecting the observations based on one-day means have been added as a visual aid. Click to enlarge. Although the accretion disk model is the accepted theory describing FUors, Kenyon et al. (2000) states that there is a feature of the models that is missing -- flickering. Flickering in other systems with luminous accretion disks is seen to consist of random fluctuations with amplitudes of 0.01-1.0 mag. After acquiring UBV photometry of FU Ori with the 60-cm Zeiss reflector at the Crimean Laboratory of the Sternberg State Astronomical Institute, which was supplemented with the photoelectric photometry from the Maidanak High Altitude Observatory and visual observations from the AAVSO, Kenyon et al. (2000) found the first evidence of flickering in any FUor. The amplitude of variation found was small, ~0.035 mag in V, ~0.015 mag in U-B, and ~0.004 mag in B-V and V-R, and was just detectable with photoelectric data covering a long time interval. According to the research team, differential photometry with a CCD on a small telescope can achieve the required precision to verify the detection, and will also provide better limits on the color variations. According to Kenyon et al. (2000) studies to find short-term variations in other pre-main sequence stars have had mixed success. Small-scale variations have been detected in other systems, but are often interpreted as "variations with a magnetosphere disk model, where the jitter in the magnetically channeled flow from the inner disk to the stellar photosphere produces small amplitude 'flares.'" Kenyon et al. prefers to associate the variations of FU Ori with a flickering occurring in the inner accretion disk. In addition to the accretion disk model, Kenyon et al. considered other mechanisms for flickering such as pulsation, rotation, as well as obscuration by small dust clouds near the central star, which is a popular model for the rapid variations seen in the Herbig Ae/Be stars (for details see Kenyon et al. 2000). Although the fluctuation is small, it certainly should not be ignored. The flickering variations, as seen in FU Ori, can tell astronomers much about the mass flow close to the newly formed star at the center of the disk. Click on the image above for an enlarged view of the light curves for V1057 Cyg, CI Cyg, and SS Cyg as presented in Keyon's 1999 paper. All this talk about accretion disk-related eruptions and flickering seems somewhat reminiscent of some other types variable stars. In fact, in his 1999 paper Kenyon cites examples of common accretion disk phenomenon with three different types of variable stars: SS Cyg, a cataclysmic variable; CI Cyg, a symbiotic star; and V1057 Cyg, an FU Ori variable. In his words, "All three systems resemble A- or F-type stars at maximum light. This spectrum cools [shifts towards cooler spectral type stars] as the brightness fades. Substantial mass loss is associated with each system; the mass loss probably increases with the rise in brightness and decreases as the brightness declines. These similarities suggest that the same physical processes govern the evolution of disks ranging in size from 0.1 solar radii to several tens of AU." Although the light curves of V1057 Cyg, CI Cyg, and SS Cyg appear to be similar in shape, it is uncertain whether there is a common link between these examples aside from the fact that they all possess a star-disk system. (Actually, both CI Cyg and SS Cyg are each in a close binary system, while V1057 is believed to be a single star.) Emphasized is the importance of understanding the accretion disks in all phases of development and evolution. Although the components and life cycles of the systems may differ from each other, the underlying physics of the disks must bare some common properties. 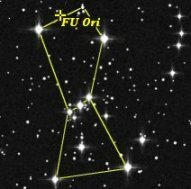 FU Ori's position in the constellation of Orion. Although the gradual rise of FU Ori from 16th magnitude in 1937 is not documented in the AAVSO International Database, AAVSO observers first started to monitor this unusual variable in 1939 with an increase in frequency of observations occurring in the late 1950s. Throughout the years since the initial eruption, FU Ori has continued to shine around 9th magnitude, and as such, is a terrific variable to observe with binoculars and beyond. Observers wishing to add FU Ori to their program may plot charts from the AAVSO web site, which show the location of the variable and the comparison stars that ought to be used when making brightness estimates. Visual observers should plan to observe the variable about once a week. When submitting visual estimates of FU Ori to the AAVSO, please report the brightness of the variable to the nearest tenth of a magnitude and the decimal portion of the Julian Date to one decimal place. PEP and CCD observers should monitor the star with a V filter, and if possible, an I filter on a nightly basis; if small-scale fluctuations are detected, increase monitoring to every 15 minutes or so. PEP and CCD observers are asked to record the magnitude as accurately as possible, i.e., to at least two decimal places and decimal portion of the day to four decimal places. Observations of FU Ori may then be sent to the AAVSO where they will be included in the AAVSO data archives. With continued monitoring, we will hopefully learn more about this interesting star! Herbig, G.H. "Eruptive Phenomena in Early Stellar Evolution." The Astrophysical Journal, 217, 1977, 693-715. Kenyon, S.J., E.A. Kolotilov, M.A. Ibragimov, and J.A. Mattei. "Flickering in FU Orionis." The Astrophysical Journal, 531, 2000, 1028-1036. Kenyon, S.J. "Accretion Disks and Eruptive Phenomenon." In C.J. Lada and N.D. Kylafis, eds. The Origin of Stars and Planetary Systems. Dordrecht: Kluwer Academic Publishers, 1999, 613-643. Turner, N.J.J., P. Bodenheimer, and K.R. Bell. "Models of the Spectral Energy Distributions of FU Orionis Stars." The Astrophysical Journal, 480, 1997, 754-766.